The Georgia State University Flex MBA program at the Robinson College of Business can be completed on a full or part-time track in a time period of between two and five years. 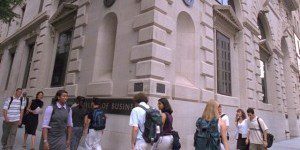 The program–held at the downtown and Buckhead campuses–allows students to pursue a course of study in business with 18 different concentrations to choose from. The program can be completed in two and a half to five years across roughly fifteen courses, depending on the student’s background and course of study, all of which can be scheduled according to individual work schedules. The Georgia State University Flex MBA core curriculum includes accounting courses, management seminars, and a capstone course called Global Competitive Strategy. Students must also take 18 hours’ worth of career-specific elective courses. The program also allows for concentration in one of 18 subjects , including accounting, entrepreneurship, finance, general business, health administration, human resources management, international business, organization management, and risk management & insurance. The typical Georgia State University Flex MBA class is approximately 61 percent male and 39 percent female, with their average age being around 29. Sixteen percent of students are international by citizenship, while 48 percent identify as ethnic minorities. Flex MBA students have an average of 3.8 years professional work experience. Eighteen percent hold previous graduate degrees. Around 100 percent of recent graduates seeking employment found post-graduate jobs. The average starting salary for graduates was $79,029. The Georgia State Flex MBA degree tuition estimate totals $8,838 per year for Georgia residents and $23,400 for out-of-state residents, assuming a full-time course load with no waived courses. Additional fees of $1,064 per semester also apply. These costs are subject to change. Financial assistance is available in the form of Federal Direct Loans, Sallie Mae Loans, research assistantships, merit-based scholarships, and non-resident tuition waivers from GSU. These opportunities are limited but present for international students. Applicants to the Georgia State Flex MBA program must have completed a four-year degree or its equivalent for admission. No professional work experience is required. To apply to the Flex MBA program, applicants must submit a completed application forms, one official transcript from all degree-granting and non-degree-granting institutions attended, and a current résumé. One letter of recommendation may be submitted as well. The school also requires applicants to complete a two-part essay about their experiences and goals. Applicants must also send in their GMAT or GRE scores and a nonrefundable $50 application fee. Non-native English speakers are required to send in TOEFL scores, though this requirement may be waived by applicants who have earned degrees from a regionally-accredited U.S. institution of higher learning.